Peter Schnyder, General Manager of The Imperial Mae Ping Hotel, welcomed J. Y. Koo, Chairman and CEO of E1 Corporation together with the Senior Vice President and Head of the Marketing Division of E1 Corp. Y.M. Park to the Redcap Tour E1 Party 2014 Mini-concert at the Imperial Mae Ping Hotel. Famous Korean Pop star Park Jung Hyun performed at the party and joined them for the photo. The incoming President of the Multinational Manila Rotary Club in the Philippines visited the Chiang Mai International Rotary Club on Tuesday, April 22, 2014 at the River Market where he participated in a banner exchange and talked about his club’s family planning in the Philippines and comparing the Philippines and Thailand’s population growth. If interested can see in print most of what he talked about at www.rotarymm.org From left to right: Tjeerd (T.J.) Bouma, Roger Lindley, Casey Takayama, and Yvonne Bouma. Jerome Sim (left), General Manager of Centara Khum Phaya Resort & Spa, Centara Boutique Collection welcomes Jaron “Top” Sorat (right), star of TV Channel 3 at a recent visit to the resort. Boonchai Suwatsakulsawasd (2nd right), General Manager of Centara Duangtawan Hotel Chiang Mai welcomed Wiboon Sanguanpong (center), Permanent Secretary of the Interior Ministry recently when the Permanent Secretary presided over a conference at the hotel’s Duangtawan Grand Ballroom. 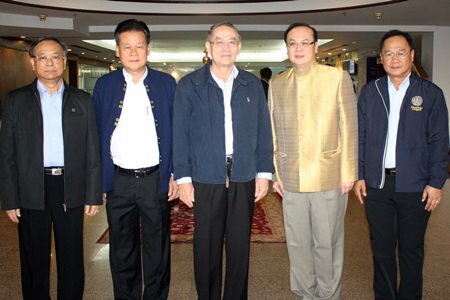 He was joined by Chiang Mai Governor Wichien Puthiwinyoo (2nd left) at the opening of the conference. Students, alumni and personnel of North- Chiang Mai University joined in the Rot Nam Dam ceremony to pour water on the hands of Dr. Narong Chawasin, a president and founder of North- Chiang Mai University and their elders at the university in Hang Dong district in Chiang Mai on April 23, 2014. Teacher of Little Stars Ambassador Bilingual School (ABS) and staff of Kiatphattana Language- Computer School (CEC) held the Rot Nam Dam Hua ceremony to pay respects and pour water over the hands of Chugait and Amporn Garmolgomut, Licensee / Manager of both academies to ask for blessings on Thai New Year at CEC. General Manager of the Centara Duangtawan Hotel Boonchai Suwatsakulsawasd and the management team of the hotel visited Governor Wichien Phuthiwinyoo (center) and his wife to take part in the Rot Nam Dam Hua water pouring ceremony at the Chiang Mai Governor’s Residence over the Songkran New Year.